Nurses and midwives enjoy working with volunteers but there is a lack of clarity about boundaries between roles, a report reveals. The study, by think tank the King’s Fund, analyses the results of a survey of almost 300 NHS front-line staff in 34 trusts about the roles of volunteers in the health service in England. The survey, commissioned by the Royal Voluntary Service and Helpforce charities, is the first time front-line NHS staff have been asked their views of volunteers. 82% of 66 nurse or midwife respondents said they enjoyed working with volunteers. 47% of everyone surveyed across all professions said there was a lack of clarity about voluntary roles. 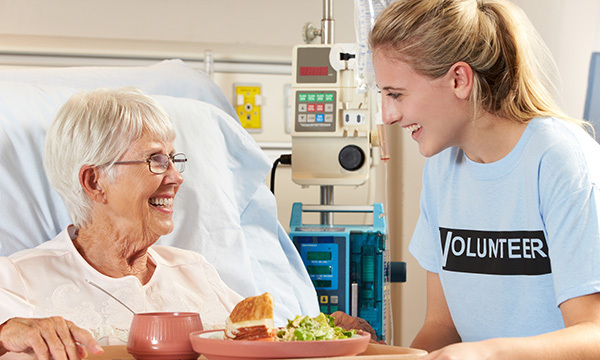 Staff describe concerns about volunteers taking on tasks they felt should be performed by porters or healthcare assistants, such as transporting patients or feeding them. Almost two-thirds of all respondents identified ‘bringing human kindness into busy hospital life’ as one of best contributions volunteers make. The report follows the publication of an article in the Daily Mail by RCN acting general secretary Dame Donna Kinnair highlighting the importance of volunteers' work to the NHS. Professor Kinnair said volunteers could help 'shoulder the burden' placed on nurses. The King's Fund report said volunteers undertake practical tasks such as picking up medication from the pharmacy, escorting patients around the hospital and running tea rounds. But some staff raised concerns about the potential of over-reliance on volunteers in services that are increasingly under pressure. Some of those questioned felt volunteers would have more impact with better training and more seamless working between staff and volunteers. The report recommends ensuring there is a formal volunteering strategy in all NHS acute care providers.